Teri Burfine, Family Nurse Practitioner - Oregon Integrated Health, Eugene. Teri Burfine has been a Family Nurse Practitioner since 2014, when she graduated from Walden University with her Masters Degree. She holds her certification through the AANP, American Association of Nurse Practitioners. Previous to that she was a Home Health Case Manager for 20 years with the last 2 years as the Clinical Supervisor. She also has a certification in Essential Oil Therapy from the College of Botanical Healing Arts in Santa Cruz, California. She received her BSN from Linfield College in McMinnville. Oregon. She has always focused on helping her clients to reach their maximum health goals. 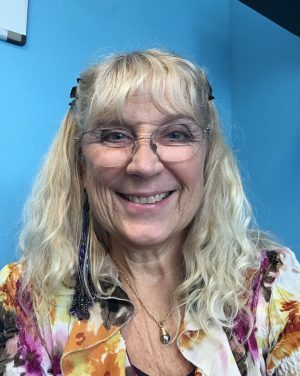 She is very excited to be working with Oregon Integrated Health with the ability to use other healing modalities to help her clients to reach their health goals. Teri is a native Oregonian, born and raised here. She has traveled a lot around the United States and abroad. She has 3 grown children who live in Oregon and California. She enjoys the lifestyle that the Pacific Northwest offers and is excited to be back here in Oregon. You may see her nearly every weekend during the nice weather on the Willamette River enjoying the sun and water. She enjoys china painting, lampwork, jewelry making, stained glass, gardening, hiking and is always looking for something new to try.